“Mother these are not tears of fear, these are the tears of joy, of beholding such a brave mother like you”. The son was Ram Prasad Bismil, the mastermind behind the Kakori Rail dacoity case, the man who popularized these immortal lines. There is a general perception that he wrote it, but was actually written by Bismil Azimbadi and popularized by him. ( The desire for revolution is in our hearts, we shall see how much strength lies in the arms of the murderer”). 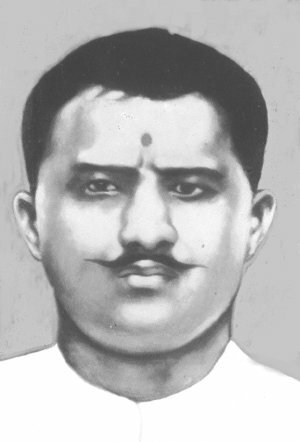 Ram Prasad Bismil was born in Shajahanpur in 1887, his ancestors hailed from Gwalior, and his native village was close to the Chambal valley. His father was a clerk in the Municipality, and later started a small business lending out money on interest. He taught Ram Prasad Hindi, and he later sent him to a Moulvi to learn Urdu too. By 14 years of age, Ram Prasad was fluent in Urdu, and read many novels. He learnt the rituals of worship from a priest near to his home and later learnt Sandhya Vandana too from Munshi Indrajeet. He was deeply influenced by Swami Dayanand Saraswati’s teachings and his book Satyartha Prakash. He took to Brahmacharya, regularly used to exercise, and practiced it rigorously. The principles of the Arya Samaj had a deep impact on Ram Prasad, which was not to the liking of his father. He even ran away from home after an argument with his father, and was later bought back by his father’s friends. Along with some other friends, he started the Arya Kumar Sabha that began to organize meetings and processions. Swami Somadevji an Arya Samaj leader came down to Shahjahanpur, and he was the one who guided Ram Prasad on matters of politics and religion. The turning point came in 1916, when Bhai Parmanand was sentenced to death for the Lahore conspiracy. Ramaprasad was an admirer of Parmanand and the death sentence made him seethe with rage. It was then and there itself that he took a vow to fight against the British government and told his Guru Somadevaji about this. His Guru advised him to think about it, as it could be quite difficult to keep a vow. That is when Ram Prasad touched his Guru’s feet and said “”If I have the grace of these sacred feet my vow will surely be fulfilled; nothing can come in the way.” It was his first step on the way to becoming a revolutionary and by this time he was an active volunteer at the Shahjahanpur Seva Samithi. Around that time the Indian National Congress was having its session in Lucknow, and it was divided into 2 groups, the moderates and the extremists. Bal Gangadhar Tilak who led the extremist group did not believe in negotiation, his goal was Purna Swaraj. When Tilak came to Lucknow, Ram Prasad led a group of youngsters to the railway station, hired a coach, and ensured Tilak was taken in their coach, instead of the car that was already arranged for him. Tilak was given a grand welcome and showered with flowers. At the same session, Ram Prasad came into contact with some members of the revolutionary committee, and soon became a part of their executive committee. However the revolutionaries were facing a funds crunch, they did not have the money to carry out their activities, or arms, ammunition needed for an armed struggle. It was then Ram Prasad came up with the idea of publishing books, on revolutionary thought that would bring in the money and also spread their ideas. Taking a loan of 400 rupees from his mother, Ram Prasad first published a book “America ke Swatantrata Ki Itihaas” detailing the American revolution. He then published a pamphlet “Deshvasiyon ke Naam” to draw public attention and sympathy for Pandit Gendalal Dixit, a revolutionary leader who was arrested in Gwalior.Dixit was a school teacher at Auraiya in Etawah,UP, and had led a group of revolutionaries called the Shivaji Samiti. Bismil drew attention to Pandit Genda Lal with his pamphlet Deshvasiyon Ke Naam as well as his poem Mainpuri ki Pratigya. Though the books were banned by the Government in United Provinces, they were circulated underground, and bought in the money needed. He also began to visit Gwalior, to purchase arms needed for the revolutionary struggle, where he bought some muzzle loaded revolvers and daggers. By now Ram Prasad became a wanted man, with Gwalior state getting a scent of his collection of arms, and once he was almost arrested by the inspector, before giving the slip. He also bought a revolver from a Police Superintendent about to retire, giving an affidavit stating he was the son of a Zamindar and needed it. By this time he managed to build a neat repertory of weapons that included rifles, muzzle loaders, revolvers, daggers and knives. On the other hand his first book on the American Revolution began to be sold all over, in spite of the ban on it. By now the police were hot on the pursuit of Ram Prasad Bismil, and they also got to know the details of the arms dump at Mainpuri, thanks to the internal infighting between the revolutionary committee members. Ram Prasad left Shahajhanpur with 3 of his friends, and stayed in Allahabad, now in exile. He had a narrow escape, when one of those friends tried to kill him while he was sitting on the banks of the Yamuna, and soon he found that his other 3 friends were plotting against him in fact. This betrayal upset Ram Prasad, and he went back to Lucknow, and wandered around in gloom for some time. He could trust none around him and his life was in mortal danger. On the suggestion of his mother, he went again to Gwalior state. His father was threatened by police to reveal the whereabouts of Ram Prasad, or else face confiscation of his property. His father sold all the property instead, and came to Gwalior to be with his son. Ram Prasad took to farming during his exile in Gwalior, and around this time, learnt to express his revolutionary thoughts in the form of books and poems. “Bolshekivon ki Kartoot”, “Man Ki Lahar ”, “Swadeshi Rang”, “Swadintha ke Devi Catherine” were some of the books he wrote. He also translated many Bengali works into Hindi as well as Aurobindo’s Yogi Sadhana. Most of his books were published in a serial form in the magazine Prabha run by Ganesh Shankar Vidyarthi as a series called Sushil Mala. Returning back to Shahjahanpur in 1919, Ram Prasad started a silk weaving factory to support his family, which bought in profits due to his hard work. He however refused to get married and settle down, as he had already dedicated his life for the country. In 1921, Mahatma Gandhi called off the Non Cooperation movement and it gave an impetus to the revolutionary movement. This decision split the Congress into two groups, one headed by Gandhi, another by Chittaranjan Das. Later Das along with Motilal Nehru formed the Swaraj Party, while the youth rallied under Bismil. He went to Allahabad in 1923, and drafted the constitution of the new party along with Sachindranath Sanyal and Dr.Jadugopal Mukherjee. On 3 Oct 1924, the Hindustan Republican Association was founded in Kanpur, with Sanyal as the Chairman and Bismil as the District in charge for Shahjahanpur, he was also in charge of the Arms. In fact owing to his organizational abilities, he was given the additional charge of Agra and Oudh too. With his business established well, Ram Prasad plunged headlong into the revolutionary movement again, organizing the workers and volunteers. However the lack of funds was proving to be a main hindrance. While he led some dacoities initially to gather money, Ram Prasad realized it was not sufficient, and there was no point in harassing his own fellow Indians. It was at such a time, while he was travelling from Shahjahanpur to Lucknow, by train, he observed that at each station, the Station Master bought bags of money and placed them in the guard’s carriage, there was no one to guard them. Kakori was a small village near Lucknow, and the 8 Down between Shahjahanpur and Lucknow used to pass through it daily. Ram Prasad decided to stop the train at Kakori and take away the money bags, this was the famous Kakori conspiracy. August 9, 1925, evening time, along with 9 other revolutionaries, Ram Prasad pulled the chain at Kakori station, and looted the Government money from the Guard’s cabin. There was no bloodshed, except for one passenger killed accidentally. Soon the Government cracked down, on the Kakori conspirators and, and arrest warrants were issued. While Chandrasekhar Azad managed to evade the crackdown, Ram Prasad was arrested along with Ashfaqullah Khan his close associate. After a long trial that lasted for a year and half Ram Prasad along with Ashfaqullah, Roshan Singh and Rajendra Lahiri were sentenced to death. In spite of massive public outcry against the sentence and appeals from many Congress leaders, the Government did not relent. Oh Lord! Thy will be done. You are unique. Neither my tears nor I will endure. Grant me this boon, that to my last breath and the last drop of my blood, I may think of you and be immersed in your work. Rajendra Lahiri was hanged on December 18th, 1927 and Roshan Singh on December 20th. On December 19th, 1927, Ram Prasad got up, had a bath, said his morning prayers and wrote his last letter to his mother. He walked without any fear to the gallows, completely at peace of mind, even the authorities were surprised. As he mounted the gallows, Ram Prasad shouted “Vande Mataram”, “Bharat Mata ki Jai” and recited the prayer “Vishwani deva savitaha dunitani”. And soon the brave son of India was hanged, his voice was stifled, but the message he gave to his countrymen reverberated wide and clear. Gorakhpur gave him a fitting funeral, with many breaking down seeing his body and he was cremated near the Rapti river. He was a true man of honour and integrity, a man who lived by his principles, never compromising on them even once. I am a 40 year old Blogger with a passion in movies, music,books, Quizzing and politics. A techie by profession, and a writer at heart. Seeking to write my own book one day. This entry was posted in Hindustan Republican Socialist Army, Modern India, Revolutionary Movements and tagged Ram Prasad Bismil, Revolutionary Movements. Bookmark the permalink. Many thanks for writing this blog, it really treat to read about legend of our freedom fighters which are removed from history book, it gives courage and inspiration to know about great revolutionary movement.